from the Vanda collection is designed to turn any bath space from ordinary to breathtakingly beautiful. to treat yourself, or make the day of family & friends on that special occasion. aesthetics remain intact all through the daily use. Experience durability that's all about giving you great value for money. - Beautiful curves create a contemporary look to suit any bath. - Mix of white and black beautifully blends into any color scheme. - Made using high-grade resin to ensure maximum durability. - Perfectly sized to fit even tight-spaced bathrooms. - Unique design makes it a great gift for both men and women. the whole bathroom accessories collection. Click 'Add to Cart' now! 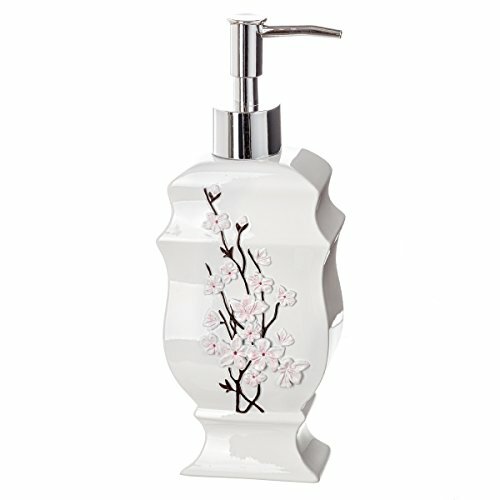 EYE CATCHING DESIGN: With A Touch of Elegant White and Ornate Textured Floral Design, This Countertop Hand Soap Dispenser Will Beautifully Stand Out. DESIGNED TO LAST: Our Decorative Hand Soap Dispenser Features a Metallic Pump That Works Smoothly and a Durable Resin Body That Is Never at The Risk of Rust. ENJOY THE VERSATILITY: You Can Use This Beautiful Piece as A Sink Hand Soap Dispenser or Fill It with Your Favorite Lotion to Make a Stunning Decorative Lotion Dispenser. FITS MOST COUNTERTOPS:Our Easily Refillable Liquid Soap Dispenser Measures 3.1" X 2" X 8.6", Allowing It to Comfortably Fit Most Sinks and Vanities. UNIQUE GIFT IDEA: Bundle This Refillable Hand Soap Dispenser with Other Items from The Vanda Collection to Create a Truly Memorable Gift Set. Click 'Add to Cart' Now!